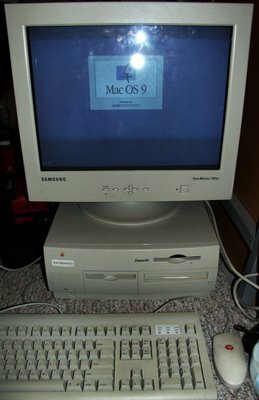 SHAOS» Blog Archive » Desktop Power Macintosh G3 "Beige"
I realized I still had some important files on 100MB Zip-discs and 1,44MB 3 1⁄2-inch floppy disks to be recovered. So I bought a USB diskette drive but had yet problems to extreact the files. Therefore I decided to re-build my old Power Macintosch G3 PowerPC with built-in Zip drive and diskette station. However I found that I didn’t have any old keyboard so I bought a PS2-to-USB adapter. But of course it was all wrong. Is there any adapter for this ”hole” to connect to a modern USB keyboard? What is the name of the ”hole”? Photo of the back of the Mac.